Gandhi was clear about how to protest; unfortunately his message of non-violence is not currently heeded even in his own country. On January 21, 2017, the Women’s March on Washington mobilized people around the world to protest peacefully after Trump was inaugurated as President of the United States of America. According to Women’s March website, 5 million people marched worldwide and 1 million people marched in Washington, DC. These worldwide protests certainly were unprecedented events following an election of a world leader. Gloria Steinem described the march as “unprecedented in my life” (as cited by Alter, 2017, p. 42). It is heartening to think that we are in the hearts and minds of people around the world. Protestors used signs and slogans to voice concerns about a variety of President Trump’s tweets, utterances, proposed changes, and perceived traits. However, according to Charlotte Alter (2017), march organizers insisted that the protests were not intended to be “anti-Trump;” rather, they were “meant to be a public declaration of a new coalition, united to protect the rights of women, minorities” and others who believe “they will be made vulnerable by the policies and politics of a Trump presidency” (p. 42). Protest photos posted online were from London, Iraq, Rome, Bangkok, Prague, Berlin, Montreal, Kenya, Brazil, and from cities around the USA. TV stations broadcasted images for hours on end. People (including celebrities) of all colors, ages, orientations, and sexes were on the street with placards, banners, speeches, and music. Viewing the various photos online, you see many serious and smiling protesters, some with families; they seemed to have fun as they protested. Can protests be serious, effective, and fun at the same time? 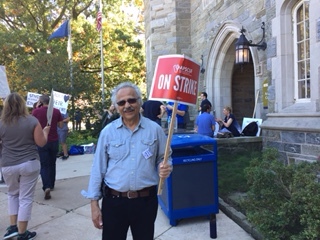 I recently partook in a peaceful strike at my university organized by our faculty union. The university closed down for three days; it turned out to be serious work, but it was also interesting and fun. We did our group walks reciting union songs and slogans while motorists passing by honked in support. Students and faculty members served sandwiches, pizza, and water. Fellow faculty members gave rides to marching protesters to parking lots outside the university campus. Nearby restaurants made their restrooms available to the striking faculty since we could not cross the picket line to enter the university grounds. A highlight of the strike was talented students from the music school who came by each day to play musical pieces (included the beautiful theme from the Games of Thrones) to support and entertain the striking faculty. Some fellow strikers recorded them on their cellphones. There was seriousness of purpose and people seemed to have fun participating in a bigger cause. We got to know faculty members from other departments, met some retired friends who stopped by to show their support. Faculty and students alike were united in solidarity. Fellow strikers took selfies and photos of other happy strikers. Media reporters were present who talked with our leaders and faculty members. It was no doubt a strike to make serious demands of the state, but it was jovial, fun, and without a single incident of aggression, micro or macro. Imagine, people taking this idea seriously—protests that are safe and enjoyable where no one gets hurt, pelted with eggs, and where no property gets damaged for taking one side or the other. With no fear of terrible consequences, I am sure many people will feel empowered to join and lend their voices to particular causes. Such peaceful protests truly do signify the spirit of Gandhi and King. Alter, C. (2017, January 30). New friends, common foe. Time, pp. 40-42.